Being in a car accident can be devastating on many levels. Being the at-fault driver of a car accident can really add to the stress of the situation. Not only do you have to deal with the damage of your own vehicle, but also with the other party involved. What actions should you take right after you caused an accident? How will it affect your car insurance? Both are common questions to ask after causing a car accident. Always stop and check for injuries in both your vehicle and any other vehicle involved. If there are any serious injuries, call 911. Exchange information with any other drivers involved. Information usually includes name, phone number, insurance carrier and agency, and insurance policy number. Also be sure to note the time and location of the accident. Report accident to the police. Sometimes you can do this by calling 311, and other times, you’ll need to place a regular 911 call. Document, document, document: Take as many photos at the scene of the accident as you can. Take photos of both your car and the other person’s car so that no one can change the story later on. Report accident directly to your car insurance agent or insurance carrier. It might be tempting to try and avoid calling the police, but it is standard procedure. 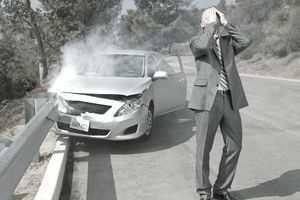 Causing a car accident is upsetting, but you ought to take responsibility and make the situation as smooth as possible. A police report is important for the not-at-fault party and will clarify any questions of responsibility for the insurance company. Often the at-fault driver has cited a traffic ticket for causing an accident. How Will Causing a Car Accident Affect Your Car Insurance? Regardless of whether or not you receive a ticket from the police, if you were more than 50 percent at-fault, then your car insurance rates will probably be increasing when your policy renews. Insurance carriers always determine the at-fault driver in a car accident. Insurance carriers can surcharge your car insurance if you receive a traffic violation for the accident or if you file a claim and are determined at-fault. The normal procedure is for only one of the occurrences to go against you, meaning you will not be charged for the traffic violation plus the claim. Some policies offer accident forgiveness if you’ve gone a certain amount of time without causing an accident. This is something to look into before, not after, an accident. After causing a car accident, you might be wondering how your car insurance policy will cover you. Damages to your vehicle will be covered by your policy if you purchased collision coverage. You will be responsible for your deductible, meaning that you must pay for damages until you reach the deductible amount, and anything above your deductible will be covered by your policy. In most states, your insurance policy will also cover the damage to the not-at-fault vehicle. Medical coverage varies by state. Some states get coverage from the at-fault party’s policy while other no-fault states look to their own policy regardless of who is at fault. The best way to get around a car insurance increase after an at-fault accident is to purchase accident forgiveness ahead of time. Not all insurance carriers offer accident forgiveness but more and more are coming out with the feature. Usually, for a small fee, you can add accident forgiveness to your car insurance policy and if you are in an at-fault accident then your rates will not increase due to the accident. After a car accident, it is important to breathe and remember the important things in life. Hopefully, everyone behaves appropriately without any unnecessary outburst. Accidents are stressful enough. It is times like these you can be thankful you have a car insurance policy in force and are able to use it.